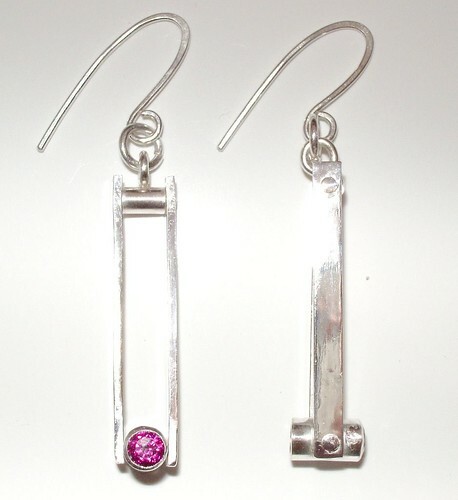 Riveted Ruby Earrings, originally uploaded by Silversmyth. Woke up this morning with this design in mind… maybe we all do have muses that whisper in our ears. If I do, mine is an early bird because I tend to get my best ideas right upon waking. The muse told me to rivet the connection points instead of how I typically attach metal… which is by soldering with a torch. The great thing about riveting is that there’s no heat involved. I will keep this in mind when summer rolls around as the Texas heat (100 degrees for 2 months straight) keeps me indoors as I prefer to solder in my garage space because of the fumes. My riveting tools all remain indoors at my workbench in lovely air conditioned space. Another great thing about riveting is that it doesn’t turn the metal black like soldering…. so there’s not as much cleanup! 2- 4mm Tube Set Lab Grown Rubies. Earrings 2 inches/5cm. Weight 3.2 grams/.11 ounces each.